Our Comacchio MC450P tracked rig is a hugely versatile machine it is able to drill geotechnical, environmental and also exploration holes to various diameters and depths. It is ideal for access restricted sites and also has the ability to drill angle/inclined holes. The rig has drilled on various mines, private and public sector projects. 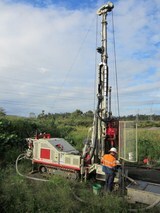 The drilling rig has regular monthly maintenance inspections that are recorded on a schedule and kept with the machine. It is fully equipped for all facets of geotechnical and environmental drilling. The rig is transported on a Volvo FM12. The float and the rig's support vehicle are both fitted with IVMS (In Vehicle Monitoring System).